On the occasion of his 18th birthday, I took Brandon T. of Killeen and his younger three siblings, Maddisen, Kayleigh, and Ian out on Stillhouse Hollow for an afternoon fishing excursion. 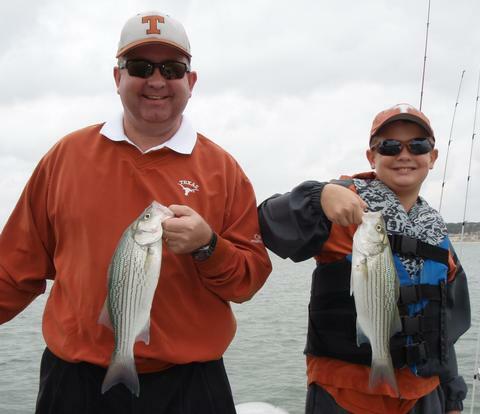 It seems the Killeen School District gave the kids an early out this Halloween, so, after leaving the schoolhouse by 1:30p or so, eldest brother Andrew brought the foursome down to boatramp and we were hunting fish by around 3:45p. The conditions were very pleasant — temps in the 70’s, dry, sunny weather, fair skies, and a SSW breeze at 5-6 which is about the bare minimum to kick the fish into gear. We started off searching deep water for schooled white bass and as we ran sonar over the second area I chose to search (Area 944), we found fish, buoyed them, hovered over top of them and jigged away with our trusty TNT 180 slabs (3/4 oz. in silver/white). In no time (less than 30 minutes) we’d boated 28 fish, including several for 5 year old Ian, which he caught 100% by himself! After the bite died down to nil, we went looking in similar areas in the 35-41 foot depth range. We again encountered a nice school of fish at Area 945 and worked them over with our slabs with nearly the same result – plenty of fish for all four kids for a 15-20 minute run, then things went quiet after boating 22 more fish. I continued searching like areas and as I did, I noted, as the sun grew closer to setting, that the bait was drawing nearer and nearer the surface. With this observed, I felt the time to transition to shallow water was now upon us (around 5:40p or so). We put away our jigging equipment and geared up for downrigging over 20-25 foot depths. Between Areas 644 and 484 we encountered a lot of bait spread from top to bottom, with the majority within the top 15 feet of the water column. We put two lines out and staggered our downrigger weights at 15 feet and 20 feet. No sooner did we set the 20 foot rod than it went off with a healthy white nailing the Pet Spoon we’d chosen. Over the next hour we boated 7 more fish here including 2 largemouth and 5 more white bass. In addition to the downriggers, I also flatlined a Reef Runner Rip Shad 200 to cover the 8-12 foot range as I began to see white bass on sonar venturing that close to the surface as we came within minutes of sunset. The flatline accounted for 3 of the 8 fish we took in this area. All four kids did great tonight, each landing their fair share of our haul. I was especially impressed with Brandon. He takes his role as big brother seriously and, though it meant giving up a shot a a few fish, tended to the needs of his younger siblings before his own as they encounter tangles and the like beyond what I could immediately keep up with. It’s rare to encounter such selfless young men these days. While away in Juarez, Mexico last week on a home-building mission trip I received a call from Jiashi Zhao. She wanted to take her 7 year old son fishing. 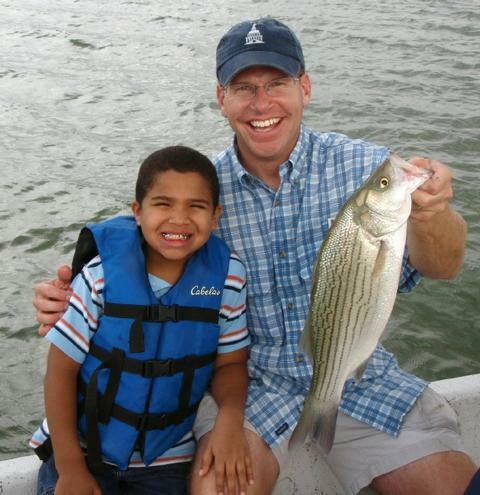 Henry caught the first fish of his life today and earned a Texas Parks and Wildlife Dept. First Fish Award doing it! Little Henry had never been fishing before in his life, and Mother Nature dealt us a tough hand to try to get him initiated, but, we prevailed. Late this past Wednesday night a significant cold front pushed through leaving us with cold, clear, calm, post-frontal conditions to deal with today. These are not impossible conditions, but they are tough. Before Henry arrived, I made very sure I pre-located sunfish so as to give him some immediate success and confidence. When Henry and his mom arrived, I greeted them with the only Chinese phrase I know which means, “How are you?” and is pronounced “Knee-How-Mah?” Henry’s mom, Jiashi, moved to the United States from China in 1998, initially living in Queens, NY. A few years ago she joined the U.S. Army where she now serves on active duty with a Quartermaster unit on Ft. Hood. We got down to the business of fishing, first with a slipfloat rig targeting sunfish. Henry boated 3 sunfish, all bluegills, in about 20 minutes’ time at our first stop, Area 239. He was so excited!! Both he and his mom were shouting and clapping!! 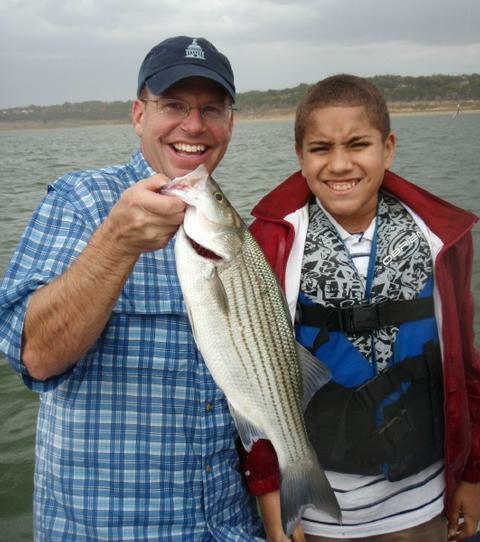 Henry’s first fish earned him a TPWD “First Fish Award”. 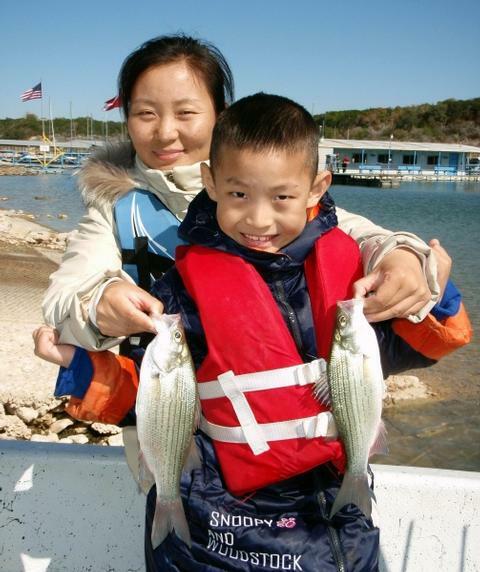 As happens with kids who are 7 years old, the novelty of our first approach wore off, so, we then chased white bass in open water using downriggers. We located fish holding tight to the bottom in 20-27 feet of water between Areas 459 and 908 and managed 4 white bass in about 40 minutes’ time. The novelty again wore off. Next, we made an attempt at locating heavily schooled white bass in open water so we could fish with a vertical jigging technique, but failed at that, which was not surprising given we had no wind at that time. So, we returned to fishing for sunfish, this time at Area 231, and Henry did much better, this time landing 8 fish with very little help. By around 11:15, a consistent, albeit light, SSW wind had begun to blow over the entire lake’s surface. 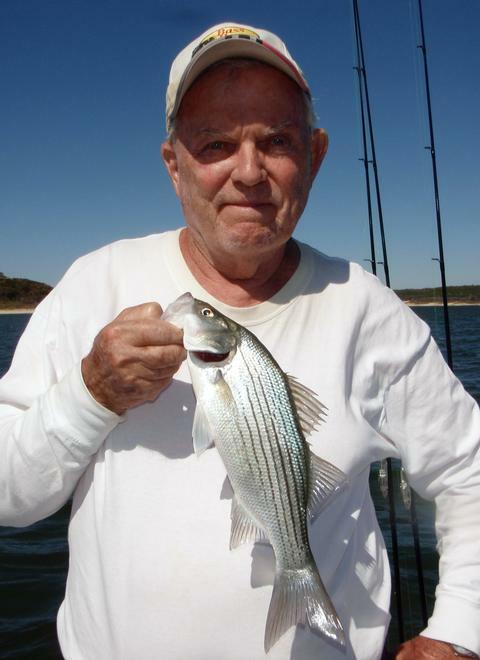 I suggested we head out to check a few more deepwater spots before we finished up our day as the direction and velocity of the wind was favorable to “turn on” deepwater white bass. As we ran sonar over Area 232, a small school of bottom-hugging white bass clearly showed in a feeding posture in about 40 feet of water. Henry, who had already practiced the vertical jigging technique with me, caught a foot-long white bass the first time his slab approached bottom. 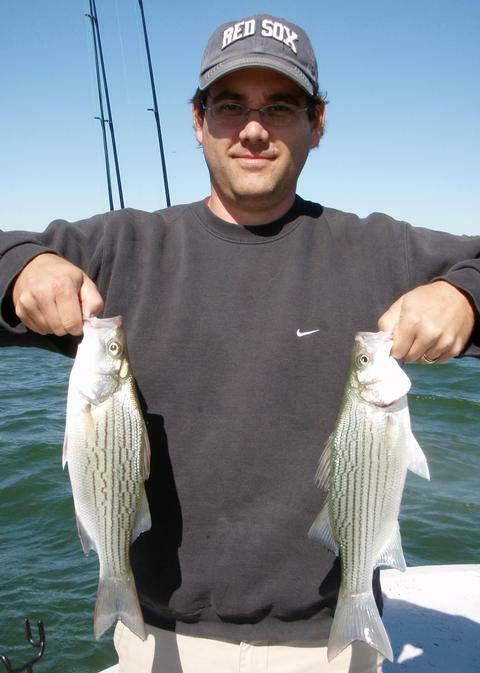 We continued working over these somewhat reluctant fish for about 25 more minutes, boating 7 more white bass. Our tally today included 12 white bass, 10 bluegill sunfish, and 1 longear sunfish. Not bad for a boy’s first trip and in post-frontal conditions!! Air Temp: 38F at trip’s start. Wind: Winds were near calm until 11:30 when a light SSW4 breeze began, blew for 40 minutes and then stopped. Skies: Clear, post-frontal, blue-bird skies. This morning I fished with Lauren and Zachary V., the children of Major and Mrs. Craig V. of Ft. Hood. Craig is currently serving at Bagram Air Base in Afghanistan and is due home on R&R in just a few days. 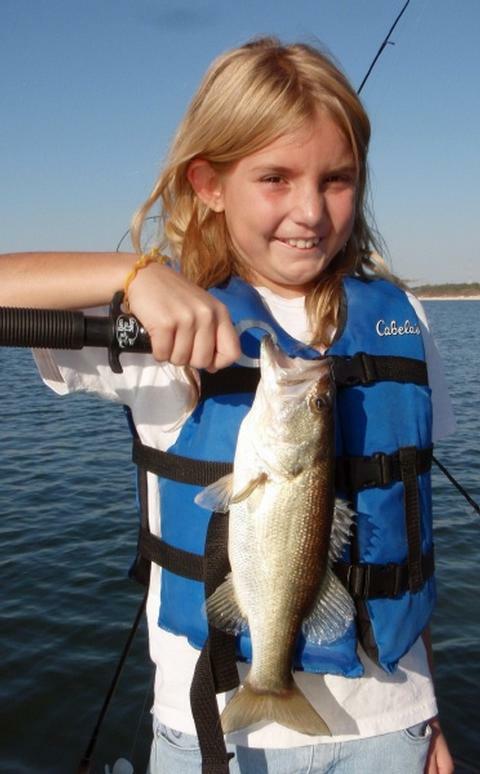 Lauren was a very enthusiastic, intense fishing student. 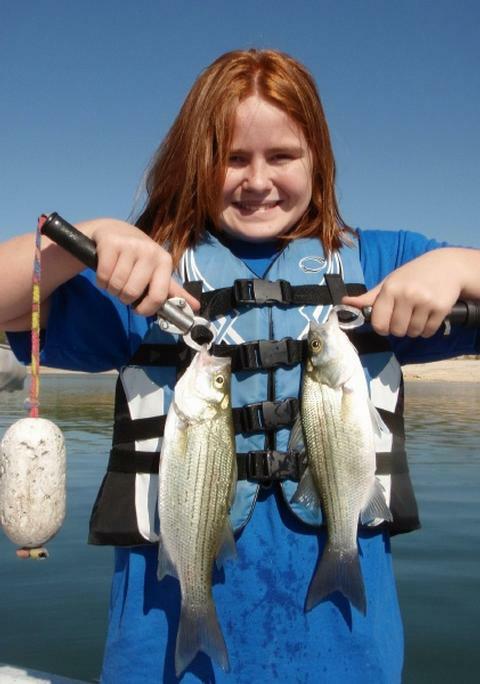 Once she caught a few fish on a given technique, she was ready to learn another, or to improve on a technique she’d already learned. 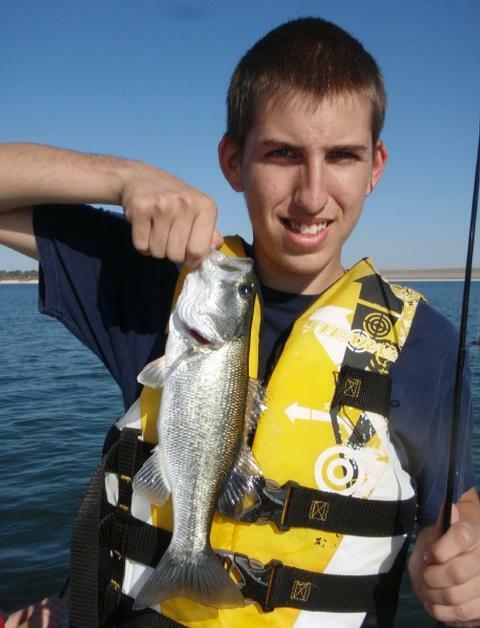 Zach was more of a “tourist” fisherman. If the fish bit, great. If the fish didn’t bite, that was great, too. As long as there was good weather, nature to enjoy, and plenty of snacks in the cooler, he was just fine! Check the blue Gatorade mustache and white powdered sugar from the last of ~14 donuts! I first got to fish with Lauren and Zach earlier in the summer on a SKIFF trip. They enjoyed their experience and were ready to go again today. We met at 7:30 and boated our first fish at 7:55. We found some steady white bass action out between 35 and 40 feet of water at Areas 931 and 933 up on top of the gentle breakline here, lasting until around 9:30. During this feed the kids boated 28 whites, 27 of which were keeper, with several exceeding 13 inches. 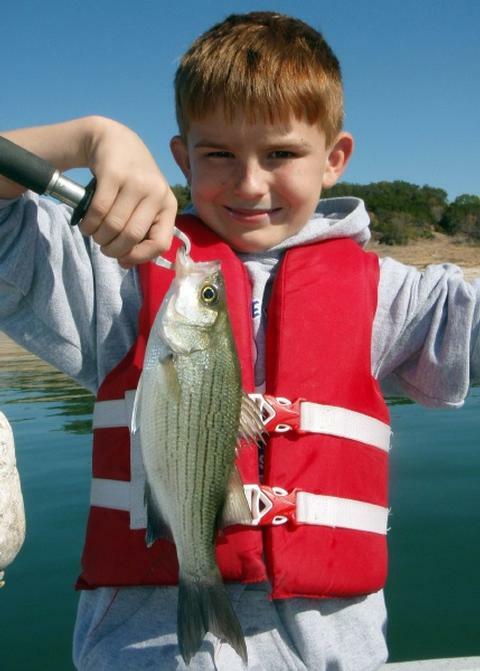 Zach caught the first fish — a nice white bass going right about 11.5 inches. Almost immediately Lauren caught what was to be the only short white bass of the entire trip, measuring around 8 inches. As I removed the hook, she looked at me with concern on her face and very honestly asked, “Mr. Bob, am I prone to catching small fish?” I just smiled, motioned to the sonar screen filled with fish beneath us and reassured her that this was not a genetic thing and that she, too, would catch fish the size of Zach’s, and maybe even larger. 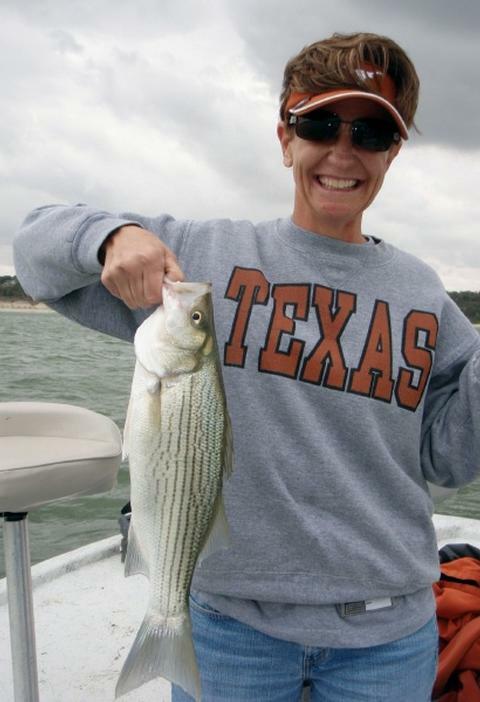 She was good with that explanation and went right back to fishing and did, in fact, catch a nice bunch of white bass by trip’s end. By around 9:30am, the gentle S. breeze which was blowing steadily at 4-5 mph since sunrise, went calm, the surface went glassy and the action died quickly. We tried 2 more areas without any success and then, by request, based on a positive experience last trip, we targeted sunfish in hydrilla beds. Last Saturday’s rain dropped ~3 inches of water area-wide. The runoff coming down the Lampasas raised the lake’s elevation a shade over 2 feet, so, some of the hydrilla that stood in jeopardy of being left high and dry was now reaching to withing a few inches of the surface — just right for sunfish given the water temperature is still in the mid-70’s. We hit Areas 231 and 200 with slipfloats and maggots and bagged 17 sunfish up to 6.25 inches. Lauren really honed on the principle of “edges” seeing how the sunfish were abundant where rock met weeds or weeds met muck, but not so abundant in the midst of the weeds or where cover was totally lacking. By 11:30 we headed back to the ramp to meet mom who seemed to really enjoy her 4 kidless hours this Saturday. The whole family is really looking forward to a trip to Disney during dad’s visit home from serving our country in harm’s way. Air Temp: 63F at trip’s start. Wind: Winds were S4 until 9:30 then went calm. Environmental Note: I noted no schooling action whatsoever this morning. Today I welcomed Mike M. and his son-in-law, Keith D., aboard for some plain old fun fishing. Mike was given a gift certificate for a trip with me by his wife last Christmas and has been itching to use it, so today was the day! Keith lips two of our 3 largest hybrid today. We caught a mess of fish, but all of the hybrid in the mix were short. Mike holds another “cookie cutter” hybrid. Although we boated white bass from 10-13 inches from this same area, all the hybrid were sized within 3/4″ of this youngster. Mike told me as we talked things over before the trip that he didn’t care anything about trophy fish, he just wanted to “put something wet and slimy over the side and have fun doing it”. 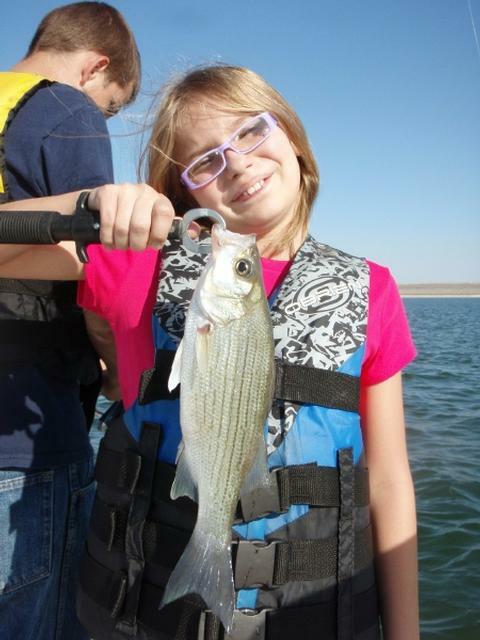 Weather is everything in this transitional fall fishing season. Watching the fronts and timing fishing trips according to their arrival whenever possible is key from now until the weather stabilizes and warms again in the spring. Today we missed the timing by a bit because the wind shift from SW to NW happened overnight, but, as the winds increased to their maximum of ~13mph in the late morning, the fish did put on the feedbag for about 75 minutes from around 10:30 to about 11:45am. Prior to this feed, we had boated a total of 10 fish (1 drum, 2 largemouth, 7 white bass) all of which came from small scattered pods of fish. We never graphed a single large concentration of fish, suspended or bottom-hugging, up to this point. When we arrived in the vicinity of Area 930, I saw, over a 20 yard stretch of bottom white “blobs” for lack of a better term showing on my StructureScan screen in downlooking mode. Traditional sonar gave no indication these fish were here. We got in a hover over these fish, Keith drew first blood, and after that first fish was hooked and began struggling, the entire bottom came alive with what had been resting, low-lying fish. We fished in a 15 foot radius for approximately 75 minutes and boated exactly 66 fish with multiple doubles and triples coming over the side during the peak of the bite. It’s funny how 3 guys can have the exact same rod, reel, line, lure and be striving to effect the same technique spaced just 2-3 feet apart and have “slightly different results”. As the tactful guide I try to be, I usually blame this discrepancy on the wiles of nature, unpredictable fish behavior, or anomaly, but certainly not on my guests. Mike, however, chose to pin the blame squarely on Keith. Once Keith edged 2 or 3 fish ahead (which implies one or both were secretly keeping score!!) then Mike began to refer to his son-in-law as his “former best fishing buddy”, consoling himself with the knowledge that whomever caught the most was supposed to buy lunch!! When all was said and done we saw 76 “wet and slimy” somethings come over the side. Keith indicated that may have exceeded the number of fish caught in ALL of he and Mike’s previous fishing adventures COMBINED!! Great trip, fellows! Thanks for coming out with me. Air Temp: 64F at trip’s start. This morning I was joined by John and Kelly M. of Troy, TX, and their 13 year old son, Matthew. John and Matthew show off a double caught just seconds apart. Matthew hadn’t used spinning gear prior to this trip, but learned quickly and did well, boating hybrid, largemouth, white bass, and a blue cat today. We came very close to postponing this trip as the wind forecast fluctuated between SE (marginal) and ESE (very tough) influenced by a low pressure system out to the west of us, but, by 7pm the night before, the weatherman stuck with SE winds in the morning changing to SSE by afternoon, and forecast decreasing cloudiness, so, we made a go of it and the calculated risk paid off. As expected, the day started off slowly with heavy clouds reducing the amount of sunlight brightening the depths, and with winds as easterly as they would be at any point in the day. We found two small “patches” of fish at Area 929 (caught 3) and at Area 301 (caught 5) and picked up fish at both areas downrigging with a single White Willow spoon and a single Pet Spoon. After Area 929 played out we went searching with sonar over several areas to no avail over the course of almost an hour. Finally, around 10am, the wind decreased significantly and the skies began to brighten although still 100% clouded over. We headed to Area 904 and saw schooled gamefish on sonar just sub-surface, as well as near bottom but holding up off of it in a feeding posture. We put downriggers down to test the waters and had immediate success and marked two concentrations of fish along the breakline on the NE quadrant of this feature. I prepared to bring the downriggers in and work these congregated fish over thoroughly with jigging spoons. As we made preparations to do that, a mixed school of white bass and short hybrid began to feed on the surface for all of 45 seconds, but, there was no doubt we were in the presence of active fish. We worked our slabs in 35 to 42 feet of water and in the end pulled 7 fish from this location before things went soft. I then headed back over to Area 929 hoping that would have come alive with the now more favorable conditions, but that didn’t pan out. I then headed us over to Area 344 and there in 35-36 feet of water we graphed a large school of gamefish and buoyed them. We immediately circled back and e-anchored over them and quickly got our slabs down to bottom. The response was instant and fairly aggressive. Long story short, we sat in that one spot for about an hour and boated 26 fish including keeper white bass, short and keeper hybrid, and even one blue cat. The fish, although responsive, were still far from aggressive as is often the case when there is an easterly component to the wind. 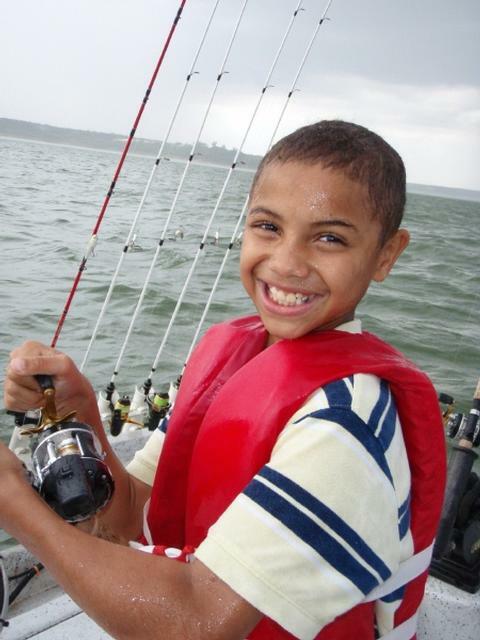 We would hook a fish, begin reeling it in, get the entire school jazzed and get a second or third hookup, only to have the school cool off and settle right back to bottom as we unhooked the caught fish and let our slabs fall back to bottom. I watched this play out on the sonar screen over and over again. Interestingly, John and I both noted that some of the more aggressive feeding came during periods of brief rainfall. By trip’s end we’d boated 41 fish and had missed a few more that came “unbuttoned” as we reeled them in. All in all I was satisfied that we’d done as well as we could have given the conditions this day. From this point on to at least mid-December fishing will rise and fall with frontal activity. Windy and warm pre-frontal conditions will see excellent fishing, while wet, cool post-frontal conditions will make for good “boat maintenance” days! In between fronts we’ll have average fishing. Air Temp: 67F at trip’s start. Wind: Winds were SE11-14 with occasional higher gusts. Skies: 100% leaden grey with occasional brightening, but no clearing. Big brother Michael Raines, 11, caught the big one today! Middle brother Justin Raines, 9, battled a hybrid as the rain came down! You can see a big drop on the end of his nose, but, he’s still smiling!! 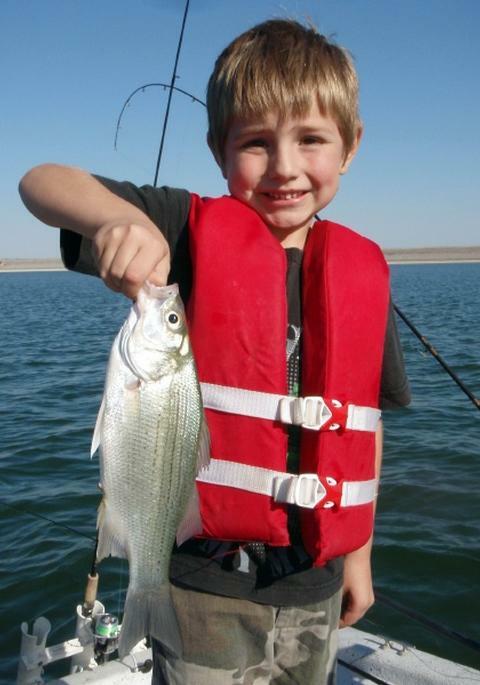 Little brother Austin Raines, 5, fished, then snacked, then fished, then snacked, then… well, you get the picture! This afternoon, in the face of very tough weather conditions, we set off to pull a rabbit out of the hat. This trip had been planned for over a month and was in celebration of Michael’s birthday. I fished a morning trip and felt fortunate to put together an average catch then. Now, weather was getting nastier so I called to offer to reschedule, but the enthusiasm level was so great, there was no turning back at this point. So, we loaded up and rolled the dice. I need to back up here and tell you who “we” consisted of, as that in itself is both heart-warming and classic “Army family” stuff. Mrs. Victoria G. (herself a mother of kids in their 30’s and a grandma currently working full time for the US Postal Service) arrived with the 3 Raines’ boys. The boys’ dad, David, is deployed to Iraq with the Special Forces and has been for about 10 months now. The boys’ mom is not a part of their lives on a regular basis, and so Victoria and her husband (an Army buddy of Dave’s) have been mom and dad to the boys for nearly a year now. Two of the boys are overcoming special needs, thus adding even more challenges to daily life. Now if that isn’t a friend, I don’t know what is. Now, add to that the fact that Victoria not only chose to fish with the boys versus leaving them in my care for a few hours, but DID IT IN THE RAIN, well, that’s why I’ve dubbed her Saint Victoria!! What a blessing people like her are to others. As for the fishing today, well, we headed to the single most productive area I had previously identified during my ~6 hour long morning trip which concluded just a few hours before the Raines boys arrived. We got right to work and got downriggers down with a spread that included a single Pet Spoon and a single White Willow Spoon. The plan, according to St. Victoria, was to fish until the little one got antsy and then call it a great day right then. Fish #1 went to little Austin. He reeled in a short hybrid and giggled and screamed the entire time he did it. That was a hoot. Next, two keeper hybrid fell to the Pet Spoon allowing Justin and Michael to get their lines stretched. And so it went for 3 iterations (3 fish for each boy), not to mention 2 boxes of wheat thin crackers, 2 boxes of granola bars, a few PB&J sandwiches and a whole box of Twinkies (I think I got it all right). I kept the largest 3 hybrid in the livewell for a photo-op. All 3 fish were 3.5 pounds+. Each time the boys lifted the livewell lid to “check” on the fish, Victoria just shook her head and said, “Those are the biggest fish I’ve ever seen!”. By around 5:30, just as she suspected he might, Victoria gave me the “sign” that Austin was about to play out, so, we brought in the gear and “went really fast” back to the boat ramp. The boys traipsed up the hill with me to my pickup and loaded into the back for a ride back down the boat ramp where Victoria was holding the boat and keeping it from getting knocked broadside and pushed up onto the shore in the stiff wind. I got the boat on the trailer and then all 4 of them hopped aboard for a ride to the restroom at the top of the hill with lifejackets and windbreakers all flagging in the breeze — this kind of resembled a parade float at this point if you can imagine that. What a fun day we had!! The boys were just so excited to be outside, in the rain, in the wind, catching fish, eating soggy snacks, and doing all they got to do — most of which is not typically a part of their day to day lives. Thank you all for making this possible!! Skies: Skies were 100% grey clouded with increasing thickness and decreasing light levels.